I first learned about WhatsApp a few months ago when a friend coming to Chicago from overseas asked me if I used the program so that we might avoid expensive international text messaging fees while coordinating our plans. Now, I'm generally a late adopter of technology and wasn't surprised that I hadn't heard about WhatsApp before, but I never expected that I was overlooking a $19 billion enterprise -- the price Facebook is paying to acquire the company. The initial market reaction to the deal seemed to be one of shock -- Facebook paid how much for a four-year old messaging service? But as the days have passed, the market seems to be rationalizing the deal as reasonable. Indeed, I've read numerous reports about how the $19 billion Facebook paid actually a pretty good deal relative to other social media transactions...on a price-per-user basis. When reading these reports, I immediately recalled the valuation metrics used during the Internet boom of the late 90s -- i.e. the "price-per-eyeball" and "price-per-click" metrics that were also taken seriously by analysts at the time. And we all know how that ended. Whenever investors valuing companies on things other than assets, earnings, and cash flows it's time to be skeptical. Maybe WhatsApp is a much more valuable asset than I think -- Mark Zuckerberg knows much more about social media than I do, after all -- but I don't believe the price-per-user metric tells us anything about the asset's intrinsic value. If anything, I'm more concerned that investment community hasn't learned the lessons of the dotcom boom and bust and is taking silly metrics seriously again. When my wife and I lived in England, we had the pleasure of visiting her relatives in a small village in Gloucestershire (still can't pronounce that name properly). Her cousins' home sat on a plot of land adjacent to a medieval castle (seriously!) that served as an orchard for longer than the U.S. has been a country. While much of the land has since found other uses, it still features a handful of the largest apple trees I've ever seen. Come harvest time, the trees have the potential to yield more apples than you would know what to do with. Just like with the apple tree, in order for this equation to work, each factor must be present. Without the investment, for instance, nothing else happens. I know this is obvious, but bear in mind that only about half of American households own stocks at all. Not everyone is taking that first step and planting the seed. It's also a matter of where the seed is planted. Just as rocky soil wouldn't allow a tree to grow to its full potential, investments in poorly run companies will likely struggle over long periods of time. Instead, look to own good companies -- that is, firms with durable competitive advantages and strong financials that are run by able and trustworthy management teams. It's these companies that will give your investment the best chance to grow over the long-term. Good companies should also be purchased at the right prices, of course, just as an apple tree needs to be planted in the right type of climate. As I noted in this post, an investment can be made in a good company and held patiently, but if it was bought at too dear of a price, it won't yield as much as the same company bought at a discount. The final step is the trickiest one of all. 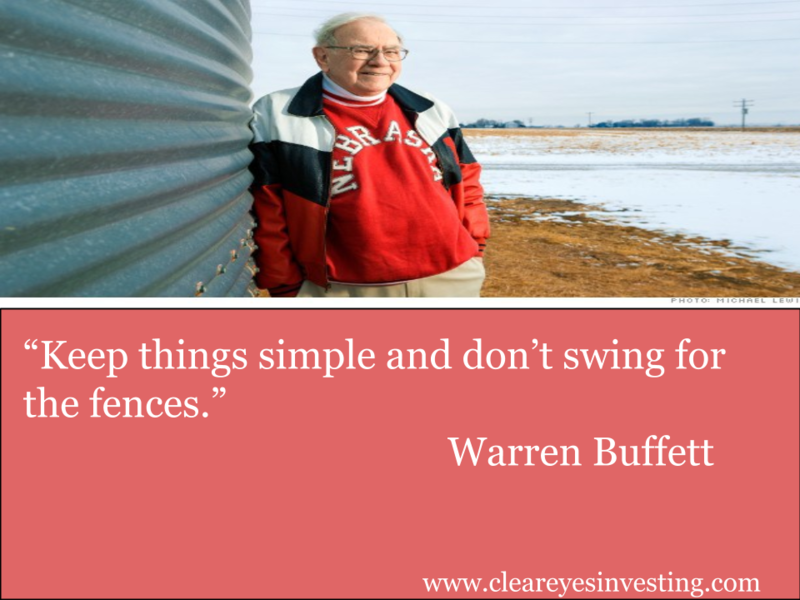 Having the patience to hold a single investment for more than a few months isn't easy, let alone a few decades, yet you wouldn't tear down a tree for not producing bushels full of fruit right away, would you? It's only over longer periods of time that both yield great rewards. Consider a simple portfolio currently generating $1,000 in annual income. Even assuming moderate levels of real dividend growth between 3% and 5% per annum and not considering additional investments, dividend income more than doubles in real terms between 20 and 30 years. Had you invested $1,000 (about $2,800 in today's money) in Johnson & Johnson in January 1980, your initial dividend income for the year would have been about $40. Meager, right? 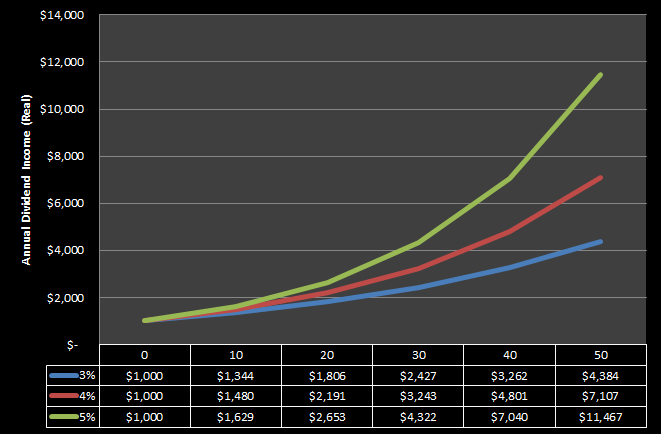 But if you'd had the patience to hold that investment over the next 33 years and reinvested every dividend, your annual income stream from that single investment would now be $2,458 per year (on top of the $83,353 capital value of your 931 shares). Or, you could have bought Kimberly-Clark, reinvested all the dividends, and generate $2,498 in annual dividends today. Without reinvestment, annual dividends would be a still-impressive $1,296 per year. What's encouraging about these examples is that these companies weren't hiding under rocks in 1980 -- they were already well-known, blue chip firms. This strategy certainly proved valuable for a number of the ultra-high net worth clients I worked with in a previous job. Indeed, it was after reviewing their portfolios that I became a believer in dividends and patient, long-term investing. Many of their portfolio holdings were high quality blue chip names that had been held for decades. The benefits of compounding growth allowed them to live off the dividend income during retirement without needing to sell shares and reduce their capital base. Their examples proved to me that such results are possible and are worth aspiring to. Again, it's the patience that I believe is the most challenging and elusive part of the formula. We're all capable of making an investment, and we can employ our experiences, screening tools, financial statement analysis, and valuation models to select promising stocks at reasonable prices, but it's the patience that proves the most difficult to follow, as it's more emotional and less cognitive. I'll leave you with this. In a 1995 interview with 98 year old investor Philip Carret, Louis Rukeyser asked him, "What's the single most important thing you've learned about investing over the past three-quarters of a century?" His answer was surprisingly simple: "Patience." That's sage advice from a man who invested through the Depression, a world war, a cold war, and various booms and busts over seven decades. If he remained patient through those turbulent times, I think we can do so today.